Being simple and mobile has its advantages. I bet at least once, you’ve recorded some audio sample on your phone. But simplicity often comes at the expense of audio quality – the phone being a perfect example. An upstart hardware project wants to change that, with a crowd funding campaign that’s winding up its final days now. The Mikme is a small rectangular box, with a single button for recording. It’s wireless, with the ability to connect to mobile apps for tweaking and sharing. I got to meet founder Philipp Sonnleitner from Vienna when he presented the project at Tech Open Air in Berlin, and even tried the prototype hands-on. Here are more details. The physical unit. 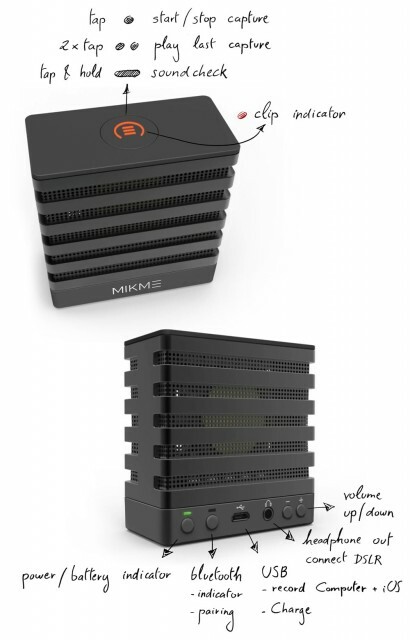 Mikme itself is a small box – part of the reason they’re able to use such a big capsule is that the capsule is practically the size of the whole unit. Rather than a lot of controls, you get one button to start recording on the top – nice in those moments when you want to get recording quickly. There’s a gold-plated, 1-inch (25 mm) condenser capsule with a cardioid pattern, which compares to 1/2″ (13 mm) electret capsules in USB mics and mobile recorders from Zoom, Tascam, Sony, Blue, Apogee, and so on. You can record at 24-bit and 44.1, 48, or 96 kHz. It’s in a shock mount, and remarkably, I didn’t notice any handling noise. The unit really is simplicity itself. Tap once to capture, twice to play back the last capture. Tap and hold for a “sound check” feature. The same button lights red if input is clipping. Along the front, there are simple green LEDs with power/battery and Bluetooth indication, USB for charging or using the unit as a USB mic, headphone out minijack, and volume up/down controls. On the bottom, you’ll find a mounting hole, and they’ve thoughtfully included 3/8″ and 1/4″ threads for mic stands and DSLR tripods, respectively. So you can easily stick this on a stand or attach it to a camera. The whole package weighs just 200 grams (less than half a pound), and it’s 70x70x35 mm – you can stick it in your pocket. 1. Standalone. Record on the unit, then offload later over Bluetooth or USB. 2. USB mic. Connect it to your device/computer and record over USB. 3. Bluetooth mic. Don’t have a wire/adapter handy? Use Bluetooth instead. Now, this may make you cringe, but that’s because you’re used to mics that transmit an inferior 8 kHz signal; the Mikme uses a full-bandwidth 48 kHz. Philipp showed off the audio quality, and it’s actually hard to tell the Bluetooth stream from the wired stream. The unit records either in MP4 (if you need more recording time) or lossless raw WAV (that’s still 32 hours at 16 GB). Also, you can record both MP4 and WAV simultaneously, so you have a compact file ready to go without conversion. Engineering pedigree. Founder Philipp comes from 8 years at AKG, but so, too, does the team’s mechanical construction engineer. Josef Schneider has a 25-year history including work on the C214, C414, C12VR, K271, K812, and K701. Richard Pribyl, who did acoustic tuning and engineering for Mikme, worked over 40 years in acoustic research and development at AKG and holds over 70 patents. Of course, that’s just resumes. The explanation Philipp gave me for why you should consider the Mikme is a combination of the capsule and all-in-one design. The capsule he says is what you would normally find in 350€+ XLR mics. Analog and digital input stage and storage are all in a single housing, so that gain staging (which is also transmitted to the app) is performed in a single place. Now, I didn’t get to properly evaluate the gain controls, again, because I had a prototype. Hardware gain was working, but not software gain controls. The finished model promises 0-30 dB gain settings in increments of 1 dB. Using the Soundcheck feature on the hardware, you can also measure 7 seconds of input and let the hardware adjust gain automatically. Use cases / hands on. On the software side, an app gives you additional controls – useful since there’s no display and limited feedback on the unit. (It’s ready for iOS now, with Android coming by the end of the year.) So you get recording, gain controls, and more. Part of the vision of the app is also rapid sharing. There’s a clever UI that organizes by pictures – though I sort of hate the use of parallax visual effects. And you also get “Instagram”-style “filter” settings for reverb and the like, which I’m surprised haven’t shown up on apps before. I have to say, I think this is a mic I’d use a lot more than other mics. There are plenty of times where I just haven’t bothered with cables and the like. The Zoom is relatively terrific, but this is more compact and might in fact sound better. Plus, Bluetooth pairing makes it more of a natural for use with the iPhone (and video), and it’s easier to fit atop a camera. I suppose a company like AKG could see their mission in a similar way – it’s really down to how you view an object like a mic. But it’s an interesting mission. Still, I’m most impressed with the mic itself, especially since you can count on various solutions for sharing. Crowd funding campaign Mikme has raised already a quarter million dollars as I write this, or ten times its funding goal. That means you can preorder a unit starting at US$189 (while supplies last). First deliveries are set for October, with the public launch in January 2016. I’m definitely impressed, and it’s encouraging that crowd funding is making this a reality. I’ll keep in touch with the makers and let you know how the progress progresses.